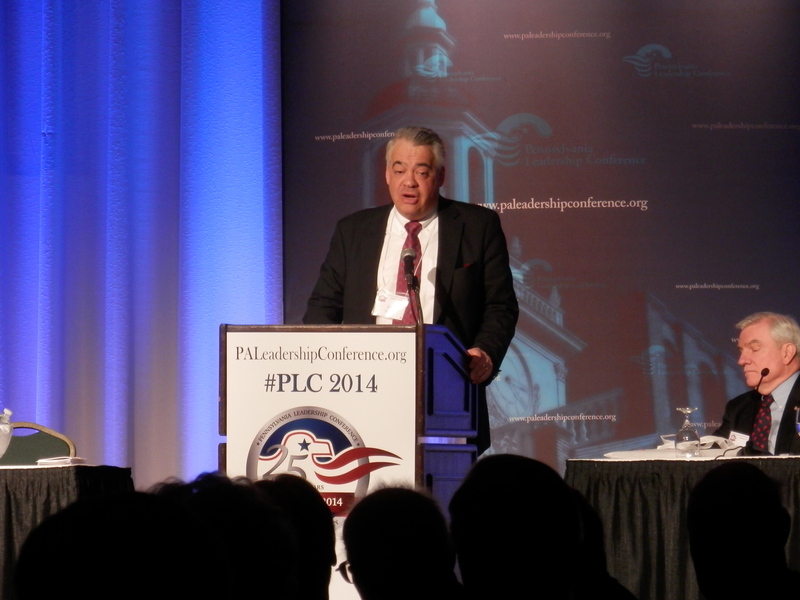 Q & A at April 2014 SVC with Lt Gov Cawley – If common sense, why are we blaming a party? Posted by * * * in Right to Work, Susquehanna Valley Conservatives. Comments Off on Q & A at April 2014 SVC with Lt Gov Cawley – If common sense, why are we blaming a party? 04.2014 SVC Q&A with Lt Gov Cawley – Will PA ever be a right to work state? Posted by * * * in Right to Work, Susquehanna Valley Conservatives. Comments Off on 04.2014 SVC Q&A with Lt Gov Cawley – Will PA ever be a right to work state? John Gizzi, NewsMax was up bright and early to begin PLC with breakfast. He reminded us that we need to work hard to get the right people elected. Matthew Brouillette, from the Commonwealth Foundation addressed the group. In Pennsylvania we have control of the legislature, but it is like trying to move a battle ship against the current of the ocean. When speaking on paycheck protections he stated unions use not only tax payers money to collect their dues, but their campaign contributions. What is the difference between a legislative employee doing campaign work out of legislative office? Or our tax money collecting union dues from paychecks to be used for lobbying elected officials? The question was asked, how can we get good republicans elected when the republican establishment eat their young? Matt reminded us of Scott Wagner, who is the first senate candidate to ever win a write-in candidate. It can be done. State Representative Steve Bloom (R-Cumberland) will speak at the Pennsylvania Leadership Council’s upcoming Quarterly Briefingon Tuesday, October 15th from 10 A.M. until Noon at the PMA Building, 225 State Street, Harrisburg. Open to all past attendees of the Pennsylvania Leadership Conference, the PLC Quarterly Briefing will focus on labor power issues and the freedom to work in Pennsylvania. Representative Bloom has introduced a number of bills that would enhance freedom in the workplace. He will join State Representative Bryan Cutler (R-York) as featured speakers at the briefing. Additionally, radio’s Capitol Watch crew (www.lincolnradiojournal.com): David Taylor of the PA Manufacturers Association, Matthew Brouillette of the Commonwealth Foundation and Kevin Shivers from the PA Chapter of the National Federation of Independent Business (NFIB) will provide a live panel discussion on how organized labor is blocking the conservative agenda in the General Assembly. There is no charge to attend the PLC Quarterly Briefing, but registration is required. To register click on www.paleadershipconference.org.